Review: An epic tale of three brothers Alfred, Tristan and Samuel Ludlow. They are raised by their father William Ludlow after the departure of their mother; the boys grow up close. 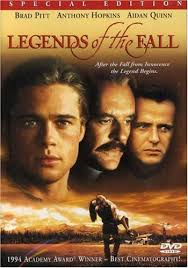 One of my all time favourite films staring Brad Pitt. This is a film that I could watch time and time again. Based on a novel by Jim Harrison. Well directed by Edward Zwick and the screenplay is well written. The cinematography is amazing. I think it is a shame that Aidan Quinn hasn’t done more work. It took the director 17 years to get this project up on screen. The music was composed by the great James Horner. Johnny Depp was offered the part of Tristan but turned it down. The themes that are very much in evidence are betrayal, history, romance and how the three boys are affected by nature and by war. At the Academy Awards in 1995 this won one Oscar and that was for Best Cinematography. Filmed in Calgary, Alberta, Canada which I have a fondness for as I have had one of my best holiday’s there! !